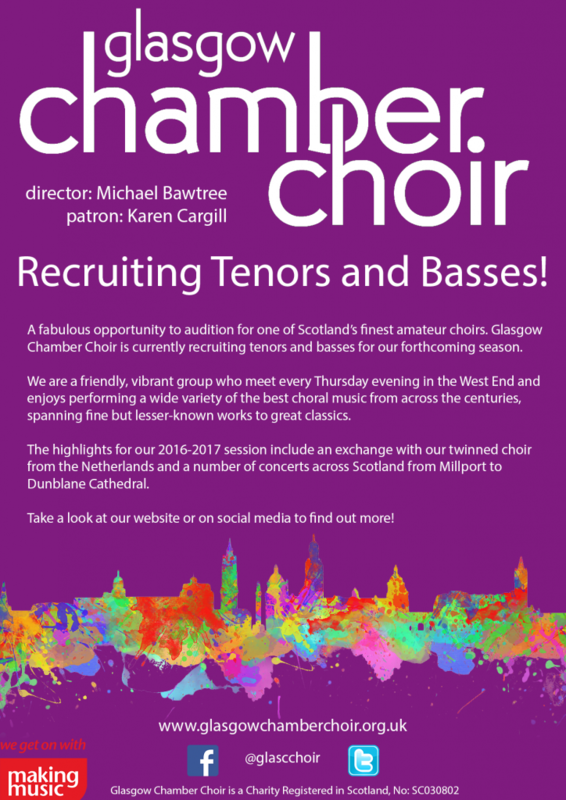 A fabulous opportunity to audition for one of Scotland’s finest amateur choirs – Glasgow Chamber Choir is currently recruiting basses ! We are a friendly, vibrant group who meet every Thursday evening in the West End and enjoys performing a wide variety of the best choral music from across the centuries, spanning fine but lesser-known works to great classics. The highlights for our 2016-2017 session include an exchange with our twinned choir from the Netherlands and a number of concerts across Scotland from Millport to Dunblane Cathedral. To get in touch take a look at the Join Us page.